Over the past few years Portsmouth has hosted the Parachute Extravaganza on Southsea Common. This is where you get to see a parachute display and other events which sometimes include motorcycle display teams and bands. Many old Ex - Parachute division people turn up to watch the display along with the public. This is also held yearly along with many other events in Portsmouth. 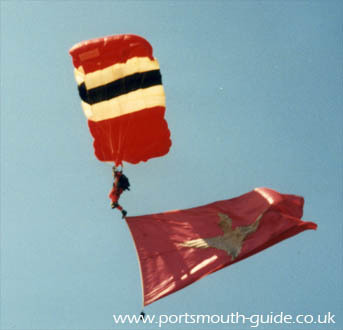 Various parachute display teams drop into the extravaganza at Portsmouth each year. The above photo is of a Parachute display team dropping into Portsmouth.